Halloween is one of my favorite times of year — not just because of all the great horror flicks on television, but also because of all the great crafts you can make. Rubber stamps offer all sorts of possibilities for creating Halloween crafts and many of them are ones that can be done with children as well. Let’s face it, Halloween for the most part is a kids holiday. But there is no reason that we adults cannot get in on some of the fun too, and rubber stamping is a great way to do this! You and your kids can make fun halloween decorations using rubber stamps. One idea to get you started might be to use a combination of collage and rubber stamping to create scary pictures that can be hung in your windows. 2. Make Halloween cards to send to friends and family. 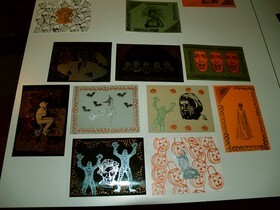 All you need to make Halloween cards is some paper and rubber stamps with Halloween designs. Stamp a few images on the front of your card, along with a nice message inside, and you are ready to go. See, it’s a cinch to share Halloween fun with your friends and family! You can even make your own envelopes if you want to. If you really want to get fancy, there are craft shops both online and off that sell blank paper and envelopes for craft purposes if you don’t want to be bothered with the task of folding and taping. 3. Make Halloween party invitations. Halloween invitations can be just a piece of cardstock with some rubber stamped art, and a black ribbon through a hole at the top. If you are going to be handing them out to friends and family rather than sending them, you don’t really even need an envelope. To stay green, try to use recycled paper for your invitations and cards. 4. Make Halloween gift bags. These could be for the children stop by your house while trick-or-treating, or those who attend a Halloween party that you are hosting. Halloween goody bags that you decorate yourself using rubber stamps can become a cherished gift that children will long remember, and hey they could use it for a candy bag the following year as well! 5. Make Halloween goodies, instead of giving candy. Yep, instead of handing out candy for Halloween this year, you might want to consider handing out inexpensive Halloween children’s books or a Halloween coloring book. The kicker: include a Halloween bookmark that you’ve designed and decorated using Halloween rubber stamps. 6. Decorate a plain candle with a Halloween design. You can revive and old candle by stamping and embossing the image onto tissue paper and then carefully melting it onto the surface of the candle. 7. 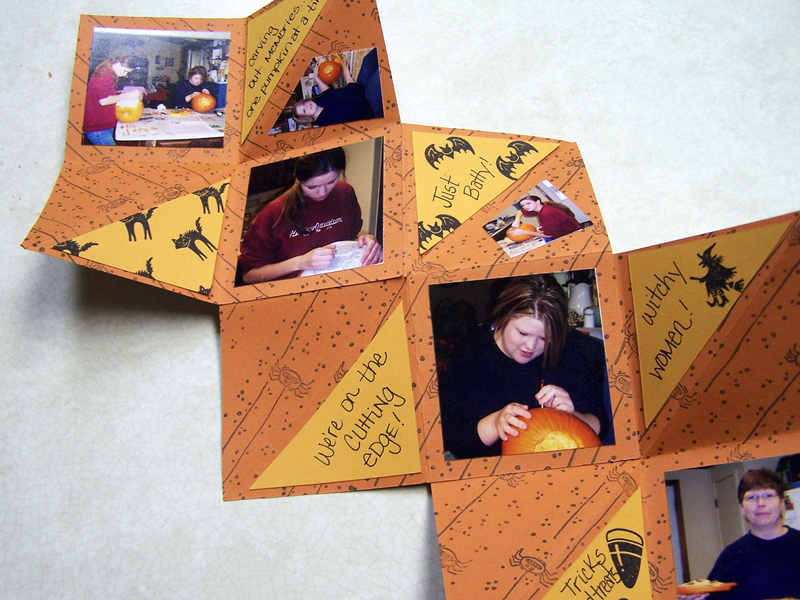 Create a scrapbook page commemorating your famliy’s Halloween fun. Scrapbook pages are another great opportunity to use your Halloween stamps. Of course you don’t want to go overboard but, Halloween rubber stamps can make wonderful accents to a Halloween scrapbook page for a child’s album or a family scrapbook. These are only a few of the many ways you can utilize your Halloween rubber stamps for the upcoming holiday. The truth is, you probably couldn’t do as many craft ideas that are available in one holiday… I know I’ve got a few ideas saved up for next year already!